Mahasti, the renowned Iranian singer whose popular music was whispered and hymmed by the youth and the elders alike in the streets and orchards of yesteryears in Iran, died after a long battle with cancer in Santa Rosa California on June 25, 2007. After she recently went public with her ailment, she endeavored to raise cancer related and preventive health awareness among her Persian/Iranian compatriots in the United States. She is survived by Sahar the only child from her first marriage with Kouros Nezamiyan, her grandchildren Natasha and Natalie, and her son-in-law Naser. In the beginning, Mahasti's family was reluctant to allow her to pursue a career in entertainment because it was not an appreciated career for women in Iran at that time. However, Mahasti overcame this stigma providing Iran with a new image for women within the entertainment industry. Mahasti created an image of a "gentle-woman" singer, a lady with great manners. Her enormous success in music opened the pathway for many other women, including her elder sister, Hayedeh, who started her work 5 years after Mahasti. The two sisters had tremendous contributions to improving the image of female singers in Iran and in transitioning the Iranian music from where it was to where it is now. Mahasti's career was remarkable. 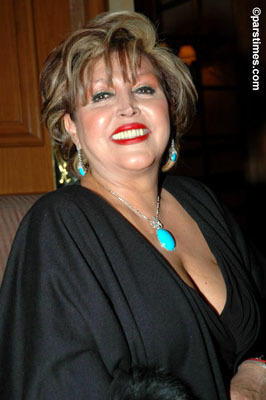 In 2005, she was awarded the Persian Female Pop-Classic Vocalist of Excellence by the World Academy of Arts, Literature and Media (formerly Persian Academy Awards) for over 35 years of top performance in Persian pop music. She had produced more than 35 music albums including Beeganeh, Havaye Yar, Ashofteh, Ghasam, Mowj, Mosafer, Nameh, Taghdir (with Golpa), To Bezan At Man Beraghsam, Asir, Hamishe Ashegh, Havaye Asheghi, Avazak, Ziafat (with Asef and Sattar), Oje Seda (with Hayedeh), Saal (with Hayedeh and Moein), Mehman (with Hayedeh), Hamishe Sabz, Deldadeh, Sarab e Eshgh, Gole Omid, Masti, Sepeedeh Dam, Haghighat (with Sattar), Labkhand (with Shahram Solati), Booye Gandom (with Sattar), Bazm (with Sattar) and Az Khoda Khasteh. In her albums she has worked with several other singers, including Hayedeh (her sister), Sattar, Akbar Golpaygani (Golpa), Iraj (Hossein Khajeh Amiri), Mahmoodi Khansari, Aref, Moein, Shahram Solati, Faramarz Asef, Homeyra, Hasan Shamaeizadeh, and Sadegh Nojooki. Mahasti aka Khadijeh (Eftekhar) Dade-Bala, was born in 1946( 25 Aban 1325), the younger sister of another famous female singer, Hayedeh. Her voice was discovered by Maestro Parviz Yahaghi, the famous Iranian composer and violinist who passed away two months ago. She was one of the rare signers who "started" her work in Golhaye Rangarang, the most prestigious music program on Iranian National Radio, in 1963 with the song "Ankeh Delam Raa Bordeh Khodaya," composed by Yahaghi and with lyrics from Bijan Taraghi. In the midst of the Iranian revolution, she first immigrated to the United Kingdom in 1978, followed by her permanent residency in the U.S. A few years thereafter. The unfortunate death of Mahasti seems to have fortuitously galvanized the Iranian-Americans in the United States. “We are once again introspecting to realize what we have endured in our lives,” a highly accomplished senior citizen university professor said. We should learn our lessons from galvanizing situations and think about what lies ahead of us and what plans we as Iranian-Americans, have provisioned. The Voice of Iranian-Americans wishes to rally our efforts, thoughts and energy in a unified channel, which could in turn assist us as a community duly recognized in the United States. Let's us join our forces and have our voice heard as often as we are recognized. Please contact The Voice of Iranian-Americans, the nationwide not-for profit organization, in New York at 1170 Broadway, Suite 510, New York, New York 10001 Tel: (212) 683-7700.